A Whiskey hamper that will soften a man’s heart, containing nuts, biltong, droe wors, chocolates and a bottle of Bells Whiskey, presented in a gift box. Same day delivery in JHB North & West only. Spoil your dad, your boss or special man in your life with this great Whisky gift box! This hamper contains a bottle of Bells whiskey and a few snacks, biltong, droe wors, cashew nuts and a box of Ferrero Rocher Chocolates. Perfect for entertaining or a little sundowner with friends or family, or for Dad on Fathers Day or his Birthday. 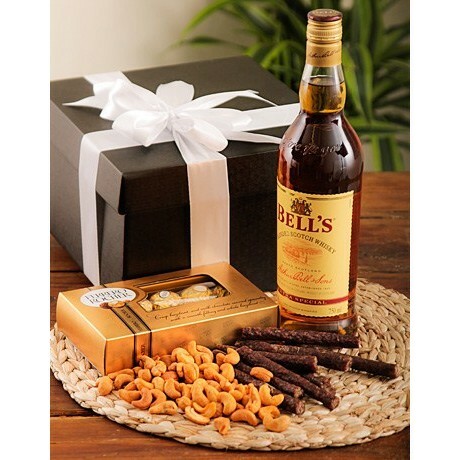 This Whiskey, Nuts, Biltong and Chocolate Hamper is available for same day delivery in Johannesburg North and West only. This gift or hamper can be delivered the same day if ordered before 12:00pm South African time (GMT +2), Monday – Saturday. While we will always do our best to honour your special requests, we cannot guarantee specific delivery times on our same day hampers and gifts. In the unlikely event that a particular gift or hamper cannot be delivered the same day, we’ll let you know as soon as possible, and you’ll have the option of cancelling your order or having it delivered the next day. Hampers and gifts are usually delivered separately when ordered together with flowers. This hamper or gift cannot be delivered on Sundays or holidays.